An understanding of fluvial sediment transport and changing channel morphology can assist planners in making responsible decisions with future riverine development or restoration projects. Sediment rating curves can serve as simple models and can provide predictive tools to estimate annual sediment fluxes. Sediment flux models can aid in the design of river projects by providing insight to past and potential future sediment fluxes. Historical U.S. Geological Survey suspended-sediment and discharge data were evaluated to estimate annual suspended-sediment fluxes for two stations on the Arkansas River located downstream from Keystone Dam in Tulsa County. Annual suspended-sediment fluxes were estimated from 1931–95 for the Arkansas River at Tulsa streamflow-gaging station (07164500) and from 1973–82 for the Arkansas River near Haskell streamflow-gaging station (07165570). The annual flow-weighted suspended-sediment concentration decreased from 1,970 milligrams per liter to 350 milligrams per liter after the completion of Keystone Dam at the Tulsa station. The streambed elevation at the Arkansas River at Tulsa station has changed less than 1 foot from 1970 to 2005, but the thalweg has shifted from a location near the right bank to a position near the left bank. There was little change in the position of most of the banks of the Arkansas River channel from 1950 to 2009. The most substantial change evident from visual inspection of aerial photographs was an apparent decrease in sediment storage in the form of mid-channel and meander bars. The Arkansas River channel between Keystone Dam and the Tulsa-Wagoner County line showed a narrowing and lengthening (increase in sinuosity) over the transition period 1950–77 followed by a steady widening and shortening of the river channel (decrease in sinuosity) during the post-dam (Keystone) periods 1977–85, 1985–2003, and 2003–10. 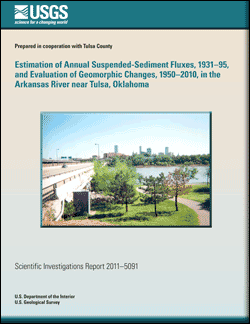 Lewis, J.M., Smith, S.J., Buck, S.D., and Strong, S.A., 2011, Estimation of annual suspended-sediment fluxes, 1931–95, and evaluation of geomorphic changes, 1950–2010, in the Arkansas River near Tulsa, Oklahoma: U.S. Geological Survey Scientific Investigations Report 2011–5091, 21 p.